Back in May, we wrote a short post explaining why we write the name of our website as GOV.UK, in capitals, and the URL as www.gov.uk, so that people know it’s a URL and know where to find it on the internet. One of the first questions someone asked in the comments under that post was: how should we say it out loud? The answer is like this: “GOV dot UK”. Or more phonetically: “guv dot yew kay”. And, if you’re saying the URL out loud, say the “www dot” too. Saying the dot out loud helps people know that we’re talking about a website, and tells them exactly where to find it. All the listener has to do next is type what they’ve heard into their web browser and they’ll end up at the right place. So there you go. 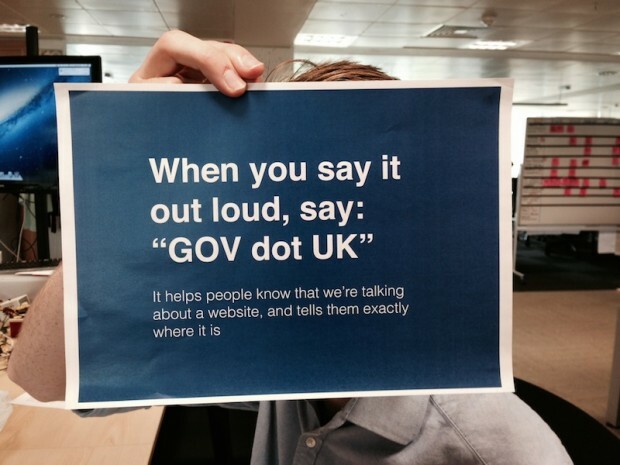 When you say it out loud, say “GOV dot UK”. Any reason why my comments and questions about http://gov.uk not working have not been published but later ones have? Hi Adrian - your comment from 2/9/2014 has been passed on to the relevant member of the team so they can answer it for you - this is why it has not been published yet - we wanted to get you an answer before publishing to help you and other comment readers. Thanks for coming back to me - if we'd had a private email route to the team, I would have asked the questions privately as they have been driving me nuts for ages. However, no-where on the site have I found a route to talk with named people privately. Not patronising really, just making it clear. I've always read it in my head as Gov UK, so to me the post has a little bit of a point. Seeing that much ink wasted wasn't nice though. You'll get me going grumbling about my taxes if you keep that up. There are a couple of issues that need addressing. 1. Most organisations are currently getting rid of the anachronistic "www" as part of their branding AND don't require it to be typed (or said) as part of their infrastructure. (AMAZON BBC EASYJET etc) Why should people have to be told it is http://WWW.gov.uk? It isn't needed and is a throw back to the days when the world wide web was a distinct part of their domains. 2. All of these organisations ensure that the root domain resolves to the same web as the "www" to avoid any issues or provides a landing page to the various sub-domains. Try typing gov.uk into any browser address bar and NOTHING happens - even the google search tries to go to https://gov.uk. Then take a look at the domain record (use http://network-tools.com/ for example [notice no www there!]). The records for gov.uk and http://www.gov.uk are completely different. Why is this? What is the problem with gov.uk behaving like all other web sites? gov.uk should be an exemplar and shouldn't need people to spell it out. This looks a 101 error! In terms of browser function, both gov.uk and http://www.gov.uk will work - they both take you to the right place. We suggest saying the "www dot" only when say the URL out loud. It's true that it's not necessary, but a lot of users (the people whose needs we are here to meet) expect to hear those "w"s as part of a URL. Thanks for fixing the problem with gov.uk not routing to http://www.gov.uk. I can assure you that when I wrote the original comment it definitely didn't work - some acknowledgement that there was a fault would have been nice! We think there is a point to this - it's about helping users. Not everyone is a confident or experienced internet user, and we have to communicate clearly with everyone, just as we build digital services for everyone. We have met users who, although they have the right website in mind, still end up saying the wrong thing out loud. I met one user this week who kept referring to "government.com". In the past, colleagues have met users who tried typing in "govuk.com". Neither of those will get you to the right place. So we're not trying to patronise (sorry if it came across like that) - we're trying to make sure that we communicate as clearly as possible with users. By that principle- if enough of your users told you that they had no idea what the 'gov' in 'gov.uk' stood for you would do an enlightening GDS blog post on it (phonetics and colourful pictures and all)? Everyone understands that the philosophy of GDS is to make things clearer and accessible to all, but this article is a step too far. It comes across as patronising and makes it look like GDS do not know how to effectively use their time. I am all for improved clarity online, but there is a thing called common sense. Lorena Sutherland in a recent video explained the fact that gov.uk was not about "dumbing down, it is about opening up" - This article does not help her argument at all. It is counterproductive. When you say, 'say the "www dot" too', you should really point out that that means "double yew, double yew, double yew dot" as I'm sure some people might simply make a longer "w" sound (as in "wwwwwhooopeeee") as opposed to prononcing the 3 letters separately. "All the listener has to do next is type what they’ve heard into their web browser and they’ll end up at the right place." Erm... if people really don't know how to verbally communicate a web address, do they know what a web browser is? Was this post really necessary - a bit patronising or am i missing something?? Patronising (pat ro nize ing), pointless (poynt less) and unecessary (un nes ses ary). It is not April 1st, it is September 1st. Do some work. How do you say excerpt out loud?